Here’s an interesting find. 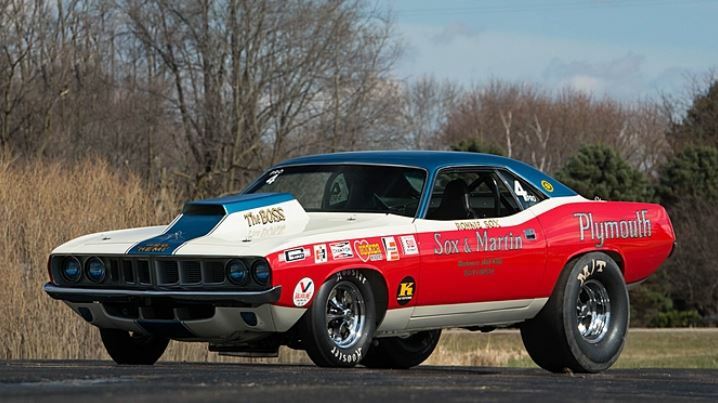 Up for bids next month at Mecum’s Indianapolis auction is a 1971 Plymouth Cuda racer. This pro stock Cuda was once a Sox & Martin team drag car. It features a 426 Hemi engine mated to an A833 4-speed manual transmission. It has been restored to 1971 race configuration and even includes Ronnie Sox’s autograph. Other key features of this vintage racer include dual magnetos, Holley 6214 carburetors, and a Weiand tunnel ram intake manifold. For more information about this car and other vehicles coming to the Indianapolis auction, check out mecum.com.